A man was arrested and an 11-year-old child injured after a car collided with three others while attempting to evade the police in Peterborough yesterday. Police requested a vehicle, a white Volkawagen Golf, to stop in Taverners Road at 3.30pm on Thursday, February 15. When it failed to stop the male driver went the wrong way round a roundabout and crashed into another vehicle, a Black Mercedes C220 sport. 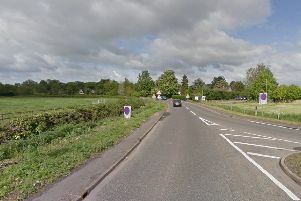 The vehicles subsequently hit a Black Audi A1 and a Silver Seat Alhambra. Nobody was seriously injured but an 11-year-old child was taken to the doctors to be checked over. A police spokeswoman said all involved were "very shaken up." A 25-year-old man from Peterborough was arrested for failing to stop when directed by police and also on suspicion of possession with intent to supply class A and B drugs.